Parameter advising is the task of choosing settings of an aligners tunable parameters that will generate a high quality alignment for a given input set of sequences. Our parameter advisor first generates a set of candidate alignments for the input by using the aligner to compute an alignment for each parameter choice in the advisor set. We can then use Facet to estimate the accuracy and choose the alignment that with the highest accuracy. To do this we must carefully choose the advisor set so that there is at least one parameter choice that will produce a high accuracy alignment for each input. Finding the optimal set of parameter choices is NP-complete, so we provided a greedy approximation algorithm to find sets that have advising accuracy that is close to optimal. Facet along with greedy advisor sets yield a parameter advisor that on the hardest benchmarks provides more than a 27% improvement in accuracy over the best default parameter choice, and for parameter advising significantly outperforms the best prior approaches to assessing alignment quality. This page provides resources for using Facet for Parameter advising including the Facet executable written in Java, precomputed advisor sets, and the benchmarks used in testing our estimator. In addition we provide a new version of the Opal aligner (v3.+) which includes the ability to run parameter advising in parallel. Journal of Computational Biology 20:(4), 259-279, 2013. 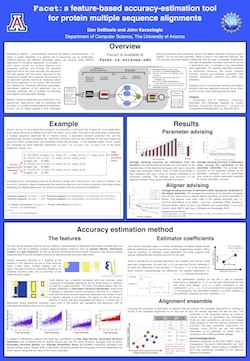 In Proceedings of the 5th ACM Conference on Bioinformatics, Computational Biology, and Health Informatics (BCB '14). ACM, New York, NY, USA, pp230-239. The Facet distribution includes the accuracy estimator (written in Java as well as a driver script, a wrapper for PSIPRED secondary structure predictor. Advisor sets can be downloaded below. The Opal distribution includes the Opal and Facet software as a .jar file as well as a driver and the scripts needed to predict secondary structure. Advisor sets can be downloaded below. The greedy sets that can be used with Opal (v3.0 or higher) for parameter advising can be found in this folder. The methods are described in DeBlasio and Kececioglu 2015 (a).